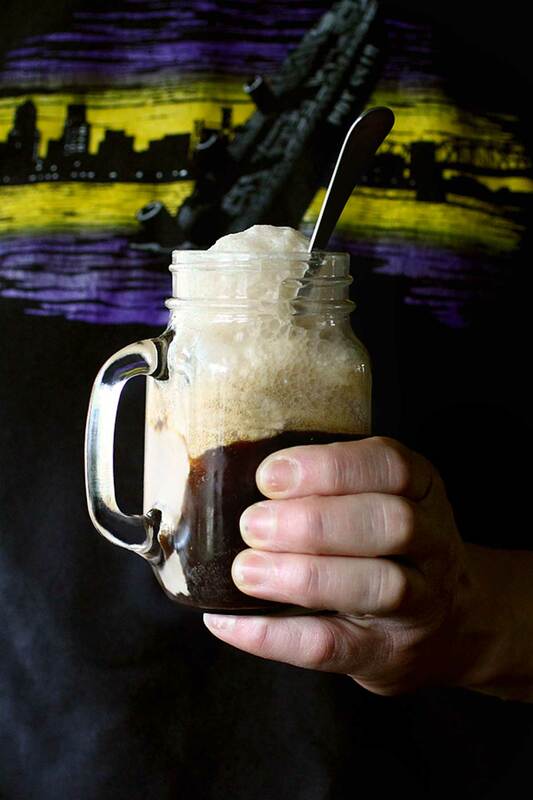 Ice cream floats for grown ups. Smoked Maple Bourbon Caramel sauce drizzled over your choice of Milk Chocolate Extra Stout or Double Vanilla Ice Cream and Extra Stout Beer. Yesterday we had an ice cream social, the house full of family, friends, and stout (root beer for the kids). I guess you could also call it ice cream sanctioned day drinking. I got up early and made ice cream. My collection of pie pans worked perfectly to help harden the ice cream as fast as possible. Ice cream before waffles. I felt like I was in a sugar cloud all day. The chocolate Guinness ice cream turned out amazing. Smooth, creamy, with just a hint of malted bitterness. I made my Milk Chocolate Extra Stout Ice Cream with Guinness but the Worthy Stout would also work. I’d stick with something that has a clean finish, nothing aggressively hopped or oaked. The vanilla ice cream tasted fantastic but texturally was a little grainy, next time I’ll up the fat content. All was redeemed by a double shot of vanilla and maple bourbon caramel sauce. Oh, and beer. Don’t forget the beer. 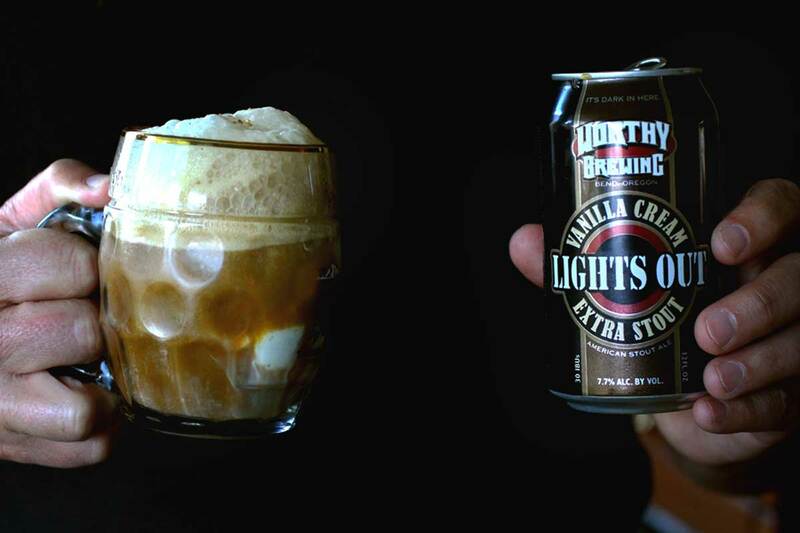 I had intended to try a variety of stouts but we quickly settled in on Worthy Brewing’s Lights Out Vanilla Cream Extra Stout. Full disclosure, a close friend just started distributing Worthy on Oahu. But that aside, I would drink this ice cream goodness under a palm tree in a hot Hawaii minute. And I’m glad he suggested the Worthy as our stout of choice. It’s brewed with vanilla but doesn’t knock you over the head with it, just enough to pair deliciously with both vanilla and chocolate ice cream. Add a generous swirl of caramel sauce and you’ve got a dessert for all seasons. Make the beer reduction, avoiding a boil if possible. I did this the night before over a very low heat and it took about an hour and a half. Make custard. In a medium saucepan bring milk and sugar to a simmer. Temper the egg yolks by adding a bit of the hot milk into the eggs and combining first before adding the yolks to the milk. Cook until just thickened enough to cling to a spoon. Place the milk chocolate in a large bowl. Pour the custard through a fine mesh strainer over the chocolate. Stir until combined. Add the heavy cream and the vanilla and thoroughly combine. Allow to cool for several hours or overnight until completely chilled. Freeze in an ice cream maker according to the ice cream maker’s directions. 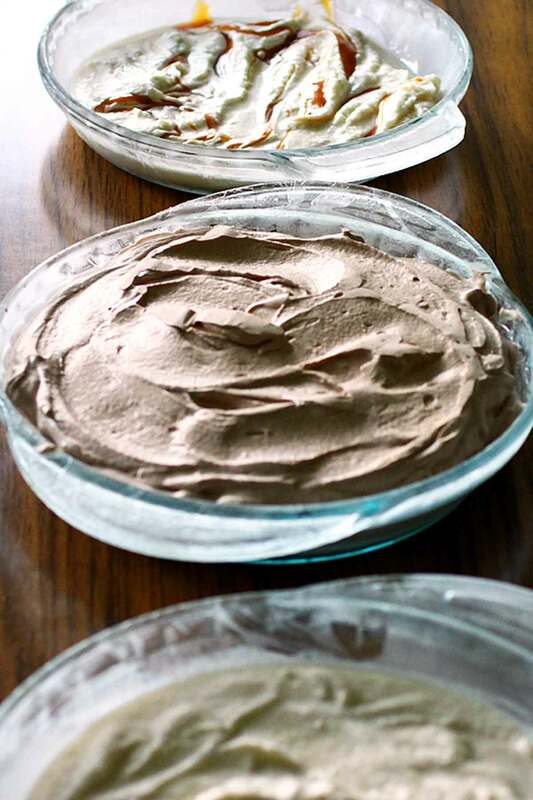 Put in a freezer safe container and allow to harden for several hours before scooping. Cook sugar in a dry 2-quart heavy saucepan over moderate heat, undisturbed, until it begins to melt. Continue to cook, stirring with a fork or swirling, until sugar is a deep golden color. Remove from heat and add Bourbon, cream, and salt. The sauce will bubble like mad and harden around the edges. Cook over moderately low heat, stirring, until caramel dissolves. Cool sauce to warm if serving over ice cream. If swirling into ice cream cool sauce to room temperature. It should be thick but pourable. 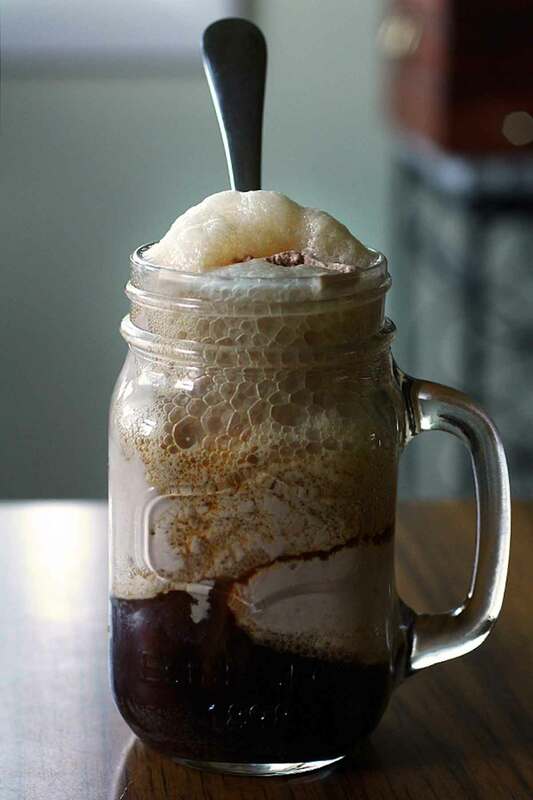 Combine ice cream of choice and caramel sauce in your drinking vessel of choice. Slowly top with stout. Add a spoon to scoop and enjoy.